For starters, take a critical look at your room and consider its dimensions. What kind of model are you looking for – spacious or compact? If your room is really small, you might even want to consider corner TV stands. Sure, you may have to play with your furniture layout a bit, but as a result a corner TV stand will give you a chance to open up a lot of space for yourself. Next, you should define your interior theme – roughly, at the very least. What is it going to be – modern, traditional, vintage, rustic, hi-tech? The step is very important to define the kind of model and the material you should be looking for. Wood – wooden television stands & entertainment centers, depending on the particular model, can be an amazing fit for modern, traditional, vintage, rustic, and mixed interiors. This is one of the most interior neutral materials, and it is easy to find any kind of assembly that would meet your requirements. Glass – glass is another neutral option that looks very classy. However, it is more suitable for modern environment rather than traditional one. High gloss – another highly contemporary option that has the capacity to ‘cheer up’ any room. 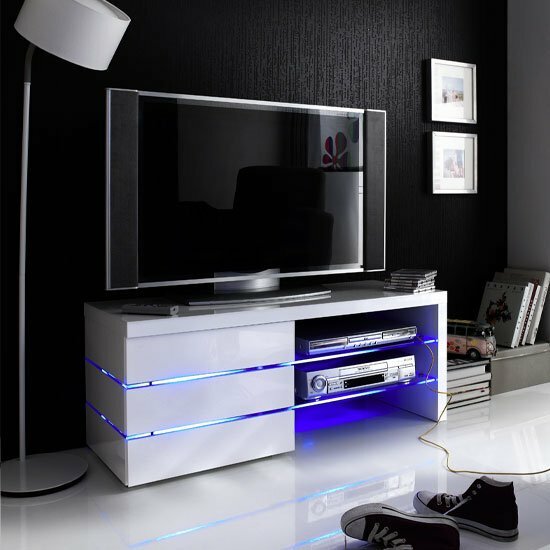 High gloss television stands & entertainment centers come in many colours, of which white, taupe, and black are the most popular ones. Finally, determining your budget and sticking to it while searching is a very wise step that will help you to save a lot of energy (and time) while looking for perfect television stands & entertainment centers. A great collection of television stands & entertainment centers is available at Furniture in Fashion store. The platform offers a truly unique selection of contemporary interior solutions to accommodate all kinds of homes and interiors. In addition, their prices are more than reasonable – so, if you are looking for a perfect balance of price and quality, you should definitely give this platform a try. Finally, the site operates in the UK, so whichever item you order there, will be delivered to you within 10 business days maximum – and even sooner, if the furniture piece is not bulky.